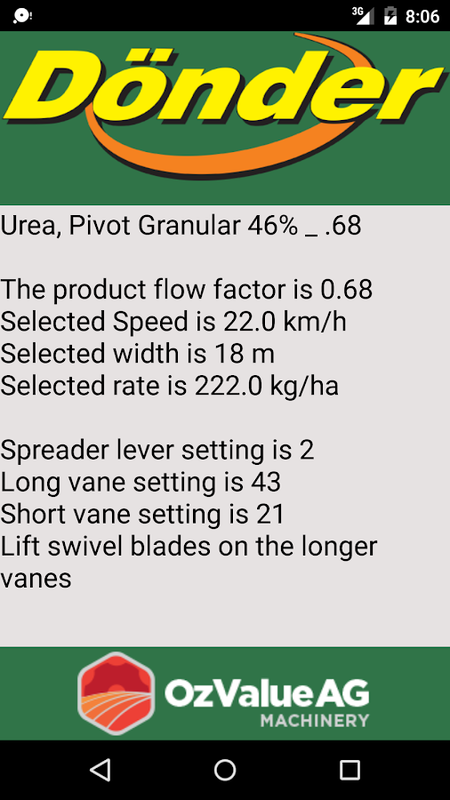 The Oz Value Ag Machinery app was created to help customer selectthe correct setting for their Donder spreders. 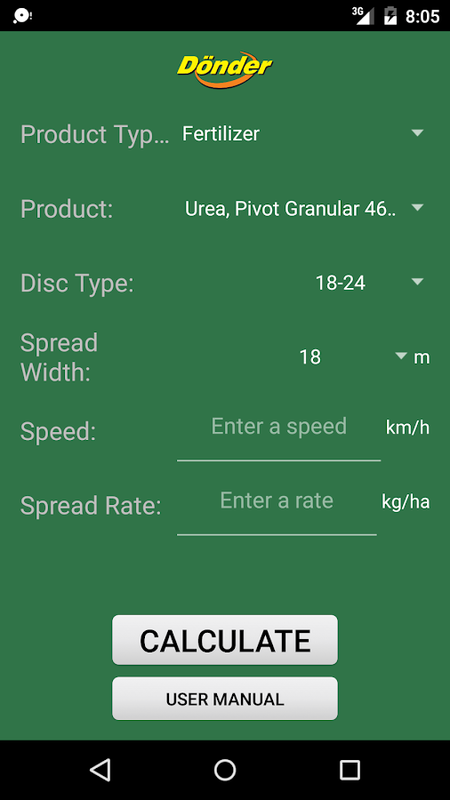 Simply select yourspread product, discs used, required spread width, speed and rateand the app works through the database to find the correct settingfor you. 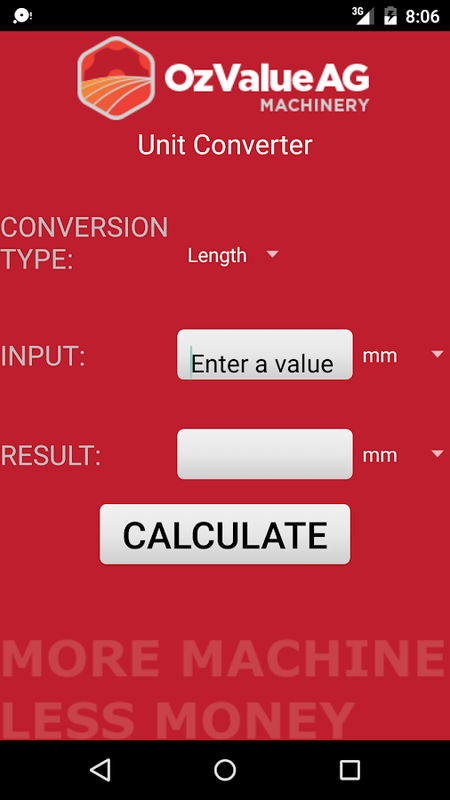 There is a basic unit converter to help out with somesimple calculations. 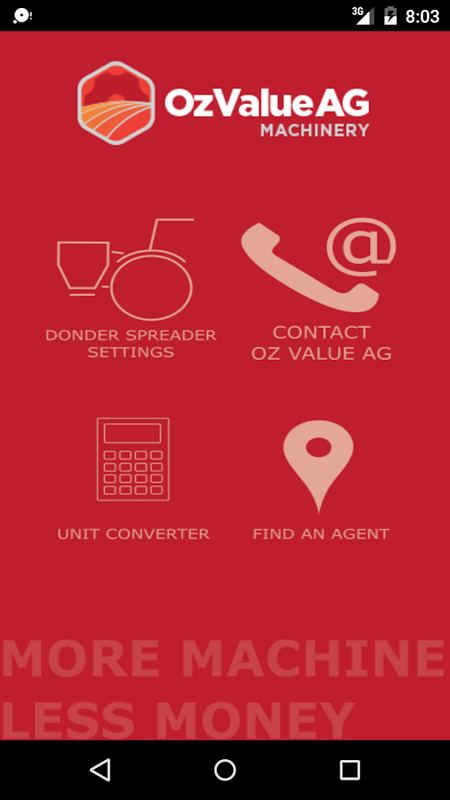 Along with this there is multiple ways tocontact Oz Value Ag Machinery including a agent finder. You are running a farm? You’re searching for or you want to sell atractor, used agricultural machines, animals, feed or accessories?Or you want to be always up to date about agriculture and browseclassifieds for the best deals and offers? Then you are exactlyright here! 🚜 Find the perfect equipment for your farm in more than25,000 classified ads and 65,000 offers in our second-hand marketwith the Landwirt.com marketplace App. ✔ Tractors ✔ Tractorequipment ✔ Harvesting technology supplies ✔ Crop protectionproducts ✔ Commercial vehicles ✔ Forestry and wood technology ✔Flea market ✔ Direct marketing ✔ etc. The App to the famous onlinemarketplace for agriculture Our App offers the entire range of thecorresponding website www.landwirt.com, THE online marketplace foragriculture. The Landwirt.com App helps you to search specificallyfor classified ads, offers and deals in your local community(between 0 and 500 km). Contact the advertiser directly through theApp and avoid unnecessary transportation by buying in your ownregion. Direct, easy & quick private ads Interested parties areable to browse through our ads or to directly search for youroffer. If somebody shows particular interest they can open thedetailpage of the private ad to get more information regarding theoffer. Buyer and seller can contact each other directly via theApp. Our App promises benefits both for buyers and sellers. Searchfor & find great deals and offers You are searching for quite aspecial machine? No problem, select the fitting offer from thecomprehensive range of our used machinery dealers and get moreinformation directly in our marketplace. Our App provides you withan exceptionally clever search engine for used machines. Browsethrough categories or optimize your results with various searchcriteria like brand, price, PS / kW, year of construction,operating hours, tyres, working width etc. Second-hand machinesnear you and abroad Find offers from Austria, Germany, Hungary,Slovenia, Italy or Switzerland. 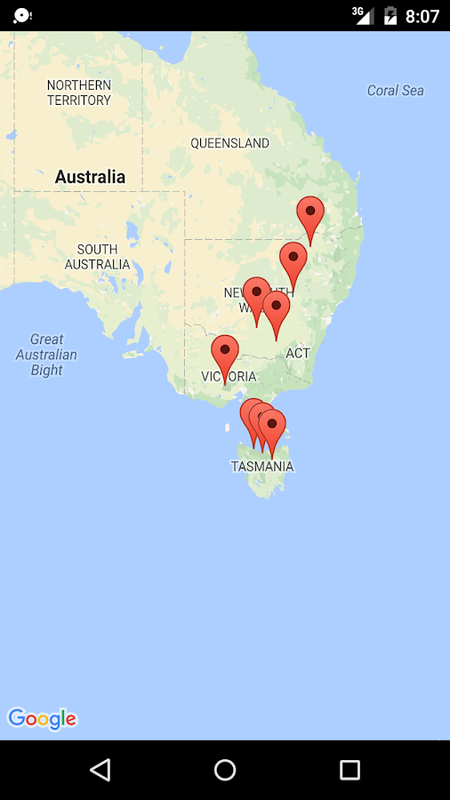 Once you have discovered yourdesired offer you can view the exact location of the offeredmachine on the map or contact the seller right away. The onlinemarketplace regarding your farm The simple and clear user interfaceof our App enables you to find the best offers, machines, tractorsand vehicles always and everywhere. Landwirt.com is the best placeto search purposefully for agricultural technology, used machinery,agricultural machines and farm supplies. We provide countlesscategories such as tractors, tractor equipment, crop cultivation,trailers, construction machinery, commercial vehicles, flea marketand many more. Everything related to your farm Find everything foryour farm with Landwirt.com. ► Used machines ► Classifieds ► Wageemployment ads ► Videos about agricultural technology, cropcultivation, horses, pigs etc. ► Agricultural news ► Photocompetitions ► Live videos Those who haven’t found what they aresearching for are looking in the wrong place! Simply download theLandwirt.com App and benefit from our comprehensive range! Did you ever want to try your hand at turning (milling) but neverhad the chance to do it? Now is your chance to create unique formsout of different materials with a fun simulation game. LatheWorker: Machine Simulator presents a perfect opportunity to operatea lathe machine like a professional machinist, without the actualrisk of accidentally getting injured and absolutely no fuss withcleaning up the mess after you finish carving. A simple tutorialleads you through basic game features allowing you to familiarizeyourself with the gameplay. It is appropriate for completebeginners that would like to get to know how to work with a latheand even engineer students that can prototype their products here.Here are some features Lathe Worker: Machine Simulator willcaptivates you with: ♦ Lathe simulation gameplay. Pick a materialto work on, set it on the lathe and start turning (milling) it tocarve your own unique artifact. Enjoy the fun of turning withoutthe actual risk of getting injured. ♦ Realistic turning (milling)physics. Lathe Worker features realistic physics movements as youcontrol the cutting knife’s advancement in 2 different axis. You’llsee the shape take form as the material is spinned. ♦ 3D Graphics.You have a 360 degrees view of the work area with the possibilityof zooming in/out. The artifact you create dynamically takes a 3Dshape as the knife advances and you can save & share yourcreation. ♦ Customizable knives. You can pick one of 8 differentknife shapes depending on what you want to create and also choose 3different widths. Thus enough customization to create an uniqueshape. ♦ Unlockable themes & products. You can unlock customlathe themes (i.e. Rusty, Ice, Lava, …) and also surprise productsthat you can re-create. ♦ Surprise interactions. Every finishedproduct will be able to be displayed in a showroom with a littlesurprise. Some of them will even allow you to personally interactwith them. Lathe worker: Machine Simulator is an entertaining gamewhere you put yourself in a roll of a lathe machinist. You canstart a new project simply by choosing the product you would liketo work on, setting the workpiece on the lathe machine and startcarving. Create brand-new, different products in your own personal,manual (non CNC) lathe machine manufacturing/production process.Workshop experience allows you to turn (mill) the workpiece in adynamic 360-degrees view. Lathe Worker: Machine Simulator willbecome your favorite simulation addiction so follow our socialaccounts to stay updated and receive the latest improvement news: ♦Facebook ♦ Google plus ♦ Twitter We would love to hear from you, soleave a review and help us make this the best pocket lathesimulator game. Grow vegetables on your plantation now! Experience agriculture inour farm simulator. Drive tractor and other machinery, harvestbeetroot, trade vegetables– run a plantation like a farmer! EuroFarm Simulator: Beetroot is beautiful and realistic, allowing totalimmersion into agriculture. Can you manage a farm life?Features ofEuro Farm Simulator: Beetroot:- Tutorial and career- Variousmachinery- Market economy- Tractor simulation- Vast beetrootplantation- Cool sound and visualsGrow beetroot step by step.Attach needed equipment to tractor or other machinery and drive,just like in tractor games. Afterwards fuel and repair it. Entiretractor simulator in a farm game! Sell vegetables to financeplantation – control every aspect of agriculture. The simulatortutorial will teach how to grow beetroot, harvest vegetables andrun a plantation. Agriculture is fun!Farm machinery is all free –use tractor, harvest machines, plow and more. Enjoy fun of tractorgames in Euro Farm Simulator: Beetroot! Plantation machinery willhelp a farmer to grow and harvest beetroot – the farm cornerstone.Complex agriculture is controlled easily in our farmer simulator.To grow beetroot is a challenge for farmer. How far will yourplantation career will go?Get a plantation on your device – live afarm life wherever wanted! Leave city routine for a while – romanceof tractor and vegetables awaits in Euro Farm Simulator: beetroot.Virtual agriculture includes a lot of stuff – cool machinery, tastyvegetables, vast plantation. Our plantation simulator is veryaccurate. Each beetroot is a success!Challenge yourself inagriculture, grow and harvest your beetroot on a plantation!Run afarm with Euro Farm Simulator: Beetroot!